iOS 5’s Twitter integration is great for Twitter users, but it doesn’t do a lot for those of us who primarily annoy our friends with Facebook. For us, the Twitter integration is just a reminder of what could have been. Luckily an app was released which brings Facebook a little closer to your iPhone. InstaFacebook for NotificationCenter is a Notification Center plugin that lets you post to Facebook… instantly! Or at least that’s what the app’s title suggests. 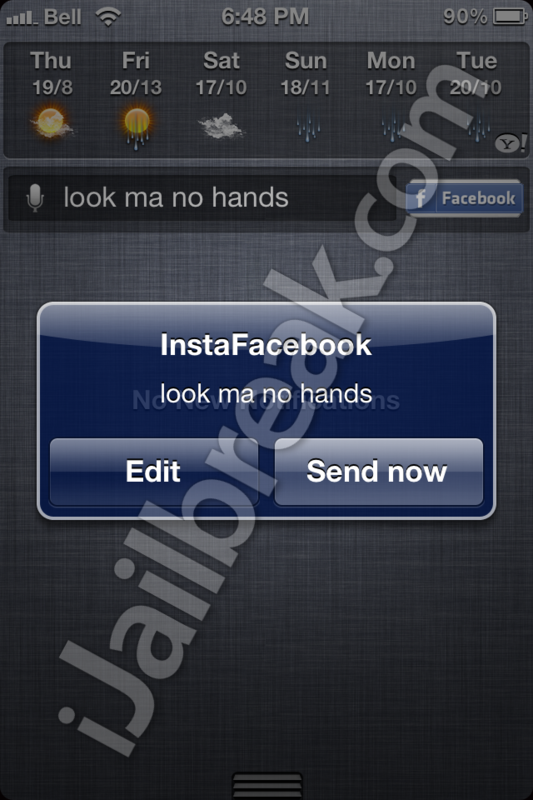 InstaFacebook is a Notification Center widget that features built-in notifications. First off, InstaFacebook for NotificationCenter is a pretty cool idea. It’s a Facebook status update bar nested into Notification Center, always a swipe away from activation. It also uses the Sara API for dictating your Facebook status, the very idea of which, for an iPhone 4 user, seems like a modern miracle of science. The downside is InstaFacebook for NotificationCenter just isn’t well executed. The plugin just seems to generate a link it feeds to Mobile Safari, which it quickly redirects through several pages until it gets to the Facebook website. This process will pull you out of whatever app you’re in and will open up a new Safari page. Since this pulls you out of whatever app you were using to Safari, this can interrupt previous activities. In terms of it’s usability, it’s currently more practical to set Facebook to an Activator gesture. It would not only make the interface far more clean if this could be processed behind the scenes, it would make the app as a whole more useful. Another caveat: Activating the dictation feature proved to be unreliable. I never figured out exactly how to activate the feature. It seemed that tapping repeatedly around the microphone icon and status bar gave me around a 40% success rate. Opening and closing the Notification Center seemed to help. A good interface will include a little animation when a button is depressed, this tweak provided no cues. I just can’t recommend InstaFacebook For NotificationCenter in its current state, but it’s a cool idea for a widget and it’s FREE. If the developer releases a more polished version of the tweak, it might be worth downloading. 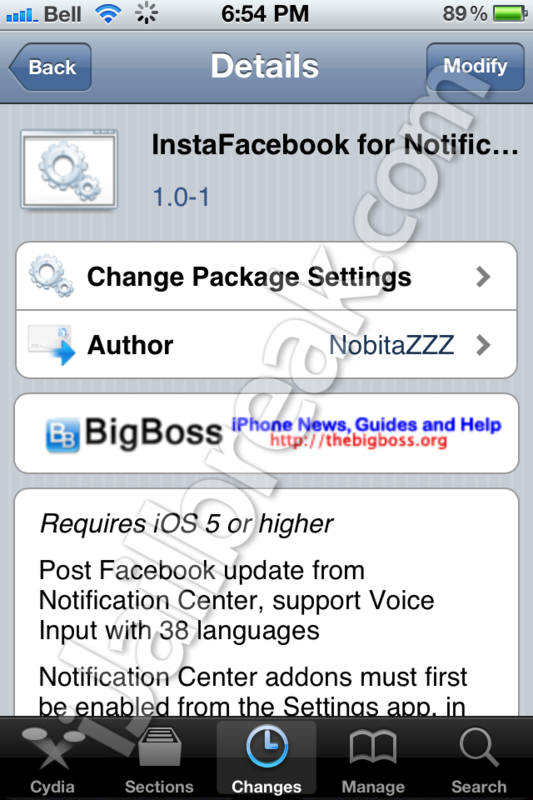 You can grab it from the BigBoss repository on Cydia. The tweak has to be enabled from the Notifications directory in Settings. What’s your favorite Notification Center tweak? Share your thoughts in the comments section below. This one seems to be performeres poorly. Any other tweaks which can do this too?